Pretty in Pink: Grow Edible Ginger! Winter Homework? Take an Online Class! Over the past decade, direct marketing has become very popular, and for good reason. Selling directly to the customer brings back a higher return and the satisfaction of a personal relationship, among many other advantages. But the time and talent to show up in person, peddling your products one by one, isn’t always the most efficient way to make sales. Meanwhile, as the local food system continues to explode, many distributors or ‘middlemen’, are sprouting up to help get the small producer’s products to market. Selling wholesale to the right distributor can save on the costs of direct marketing and move a larger quantity of product in an efficient manner. Who are these distributors? They are a diverse crowd using new models and reviving old ones. We’ll be getting to know a different one each issue, so that you can get familiar with the methods these “middle” entrepreneurs are using to move local foods to markets and decide if selling to a distributor is right for you! For our first profile, Becca Jablonski spoke to Sarah Avery Gordon, the founder and owner of FarmieMarket.com. 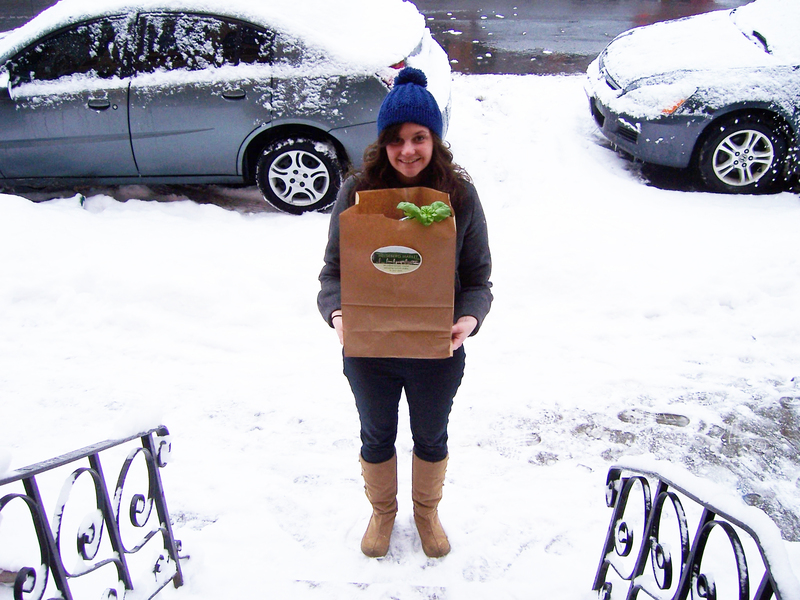 FarmieMarket.com is an online farmers’ market that allows customers to place orders and have local food delivered to their door. FarmieMarket.com started in Albany County, NY and has now spread to Schenectady, Rensselaer and Saratoga Counties. The goal of FarmieMarket.com is to keep small farms in business by limiting their costs associated with marketing. Q: Why did you start FarmieMarket.com? A: I started marketing products for my family’s farm online. My family’s farm was struggling after my mother, the farm’s business manager, passed away, and I didn’t want my dad to have to take an off the farm job. So, I set up a website and a facebook group. In the first month our sales doubled. More of our farming friends were interested in my help marketing their farms, so I set up a central marketplace—Heldebergmarket.com. We started with 8 producers—mostly friends I knew in the area—people that made really quality products. When I started talking to more small farmers, I found that many experience the same barriers marketing their products through weekend farmers’ markets. Many small farms are really mom and pop operations, and for them to have to sacrifice one or two members of the farm to go to farmers’ markets (which may be all of the farm labor), it is just too much. Farmers’ markets in the capital district often have really high fees – like up to $600 – which can also be a barrier for some people. Plus, the more successful farmers’ markets in our region take place in the summer, when people like my dad are too busy bailing hay. My dad would love to go to winter markets, but many don’t have enough foot traffic. By grouping small farms together and marketing our products through a central website we can gain some synergy and overcome many of these barriers. Q: The original FarmieMarket was the Heldeberg Market. Why did you decide to expand? A: Because I had people calling me from all over the Capital Region, but I didn’t have the ability to work all of them into my Heldeberg Market schedule. In wanting to serve more farmers and more customers, I made the decision to divide and conquer. Now I have three FarmieMarkets, and serve each territory on a different day. Q: What has the response from customers been? A: Awesome! I have been getting a lot of word of mouth referrals. I have picked up a lot of customers that are very steady – they order every week or every other week. Q: It must be difficult to operate three markets. What are your biggest obstacles to business efficiency? A: It’s a lot of juggling, but I’ve been really fortunate to use technology to make it efficient. I set up a program that automatically tallies my orders each week and emails farmers their sales reports. The farmers get the products ready and bring them to the drop site and I don’t have to worry about anything. This way I don’t have to email producers in the middle of the night – the technology is working while I am sleeping. Q: Wow, you seem to be really computer savvy. How did you learn to set up an online market? A: We had a computer in the house at a really early age. My grandfather bought a computer in 1987! I have never had formal computer training, but I have good intuition about how to use it and how to figure things out. Q: Do you have any plans for further expansion? A: I do actually. I have received requests from all over the country. A few national farming blogs have picked up on the market – The Greenhorns (http://www.thegreenhorns.net/) and Seedstock (http://seedstock.com/) have both run articles on the market. The FarmieMarket concept is really gaining traction, so I am actually going to organize an educational series this winter to give entrepreneurs the skills they need to set up FarmieMarkets in their area. My plan is to keep everything under the FarmieMarket umbrella, but each individual market will have its own local flavor – in Rensaleer County, for example, the market is called Uncle Sam’s Farmer Stand since it is the birth place of Uncle Sam, but it is still a FarmieMarket. Q: What types of products do you sell through FarmieMarket.com? A: We have a full range of grass fed beef, grain finished beef (as long as the grain is grown on the farm), pastured pork, lamb, eggs. I am really trying to focus on value added products. We have lots of seasonal vegetables. I work with a few farmers who have greenhouses and high tunnels so we can offer products year-round. We are also diversifying into prepared foods. I am working with a local chef on this. Dairy is coming this spring. Q: Are there products that you have been unable to find (I know there are always farmers looking for new product ideas)? A: Yes, there are. That is one thing that is cool about the market – I have all of this information about what we have available/how much farmers produce, and I have done a bunch of research about what could be grown in the area and isn’t. I had a meeting for my farmers last winter and we quickly realized that collectively we were growing too much zucchini. There are lots of products I would like to try to get – more beans for example. I recommended growing beans to a farmer I work with; he planted kidney, black and yellow beans this summer, and has already sold out. Q: If farmers are interested in selling product through FarmieMarket.com, how should they contact you? A: They can actually go to the website, and on the front page of the website there is a button that says “Farmers: Join the Revolution!”. They should print out the application, fill it out, and mail it to me and I will get back to them as soon as I can. Becca Jablonski is a PhD student at Cornell University conducting food systems research. She may be contacted at rb223@cornell.edu. Thanks to the following funders for their support of local food distribution research: the Cornell Center for a Sustainable Future, NESARE, and the Cornell Small Farms Program.